As I stood in the entryway of the new L.L. Bean hunting and fishing store, I have to admit the layout was really splendid. Artisans and architects alike had worked together to design not only an elegant but extremely functional space. Door handles made in the shape of fly rod and reels, a large stone fireplace, an assortment of mounted animals, a giant fresh water aquarium and a number of other accents showed an attention to detail that would appeal to any sportsman. So, perhaps it was this initial heightened impression that caused the remainder of my visit to be such a disappointment. It made me wonder, had L.L. Bean, in their infinite wisdom with all things outdoors, accidentally created a space that sets the stage for making hunters and fishermen disgruntled? In the past, I have mistakenly bought books with fantastic and beautiful cover art only to find that they actually contained no prose or words of substance? Has L.L. Bean created the proverbial “book judged solely by its cover”? For a company that started out with “the Maine Hunting Shoe” you would think that over the decades they would have managed to learn something about the basic wants and needs of sportsmen. However, as I looked over the limited selection of duck decoys and nearly drowned in yuppie wear, I began to get that sick feeling in my stomach that indicated that once again L.L. Bean had failed to market to the outdoors men and women of this state. Oh, I suppose you could say I am a little embittered concerning the whole fiasco of their decision those many years ago to distance themselves from the whole hunting and fishing thing. I mean, why else would they have moved the entirety of these two operations to their own separate space on the Freeport campus? Oh sure, if you talk to the execs in the big offices they will tell you that statement is completely inaccurate, but that is what I and many other sportsmen actually saw. L.L. Bean physically moving away from hunting and fishing and instead servicing the large fat cash cow that is the modern yuppie. Being a Maine based company that has rich roots in this state I really want L.L. Bean to succeed. I applaud them for staying in our state all of these years and employing the thousands of Maine individuals that are necessary to make the business run. In addition, they help to support a huge portion of the local tourism industry (restaurants, hotels, outlets, etc.) as out of state visitors flock to Freeport and the surrounding towns in the summer months to visit their flagship store. It therefore really pains me that they appear to just now be making a last ditch effort to appease the sporting public before mega giant Cabelas establishes a firm foothold. See their fear is based on the fact that most people have a brand name that we look to for knowledgeable, dependable and reliable service. L.L. Bean is no longer the only game in town and perhaps a little too late, they have realized they have been failing for years to address the needs of sportsmen. If as a consumer we feel undervalued or that our needs are not being met, we will shop elsewhere and our chance of return is slim. Don't think this is the case? The next time you go to your mail box and it is filled with magazines which ones immediately go to the trash and which ones end up on your night stand? See we recognize certain companies as being our “go to guys” and establishing “go to” status is the ticket to cashing in on the multi-millions of dollars sportsmen spend every year. I have a statement that should scare the hell out of L.L. Bean and this is the fact that Cabelas is awesome. I didn't come to this conclusion by traipsing around their new store in the southern part of the state, nor when pestering their excellent customer service representatives with dozens of questions. No, oddly enough I came to this simple conclusion while sitting on the porcelain throne and thumbing through their “hardcover” catalog. You see, what I had failed to grasp until that very moment was the extent of the genius behind Cabelas marketing. They had eloquently appealed to their customers sense of self worth by sending “highly valued” customers a hard covered edition. I thought back and remembered my surprise when upon opening my mailbox that wondrous afternoon, I realized that Cabelas had selected me for hard covered status. I remember immediately calling all of my family and friends to see if they too had been selected, and I was thrilled to hear that only my brother (another rabid outdoors man) had also been hand picked for this coveted prize. Pondering on this entire sequence of events, I thought of the hundreds of catalogs I had thrown out in the trash Orvis, Bass Pro, L.L. Bean, etc. over the previous year without a second glance and it was at this time that I looked down in my hands at the heavily worn hard covered edition and knew that L.L. Bean was in trouble. Not only do the boys at Cabelas understand the needs of the hunter and fishermen but they also work hard to show us that we are special and our sport is valued. They understand the complete needs of the outdoors man, and are equipped with not only the merchandise, but the extensive expertise to prepare you for absolutely any hunting expedition you can dream up. 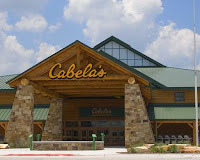 I don't care if you are hunting Reticulated Pythons on the Amazon, chances are someone at Cabelas had been there and done that and can provide you with the information you need to be successful. I challenge anyone to stop into L.L. Bean and try to get outfitted for a trip as simple as a Caribou hunt in Northern Quebec. I am going to bet they won't have a clue. If there is one tiny shining hope that I can see in the new L.L. Bean hunting and fishing expansion it would be their addition of a few high quality used firearms at prices that are very reasonable. I have on three occasions stopped by the store since its opening with the expressed purpose of seeing what was newly available. On one of those rare trips, I even purchased a 20+ year old Browning 30-06 that was in mint condition for much less than same model at Kittery Trading Post in “fair” condition. In addition, the small number of firearms means that they are polished and not “well handled” like the firearms at Kittery and the sales person appeared knowledgeable. I suppose to be fair in my assessment of L.L. Bean and Cabelas it is only fair that I take a trip to see the new Cabelas store in the Portland area and walk around and talk to some of their sales men and women. I hear it is great and that they too have an impressive collection of firearms, but for now I guess I will have to wait. For you see, I don't have enough money to buy the fuel it would take to travel down to Portland on a joy ride just to check out a retail establishment . . . so sadly, I will have to just wait until I am in the neighborhood. Until then, I will just have to be happy continuing to read through my well worn Cabelas catalog. Very good point. 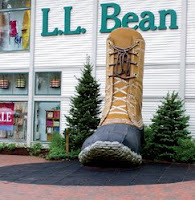 I have been disappointed for years that L.L.Bean has gone away from the true outdoor sports identity. It has gotten far too trendy. This has been going on for years. Their limited supply of hunting and shooting gear is a disappointment. Try travelling from CT to ME to shop there, only to discover that I would have had better success at a local gunshop. By the way, Cabelas is well worth the trip. It is truly what L.L.Bean used to be, only more convenient locations. Nice article, Vose. See, I do read your blog! "Trendy" . . . yes very good descriptor. L.L. Bean has morphed into a cross between American Eagle Outfitters, Banana Republic and Gap. Sad how far from the their original roots they have strayed. LOL! Yes, I guess you do! Very good piece, I don't have an LL Bean here but its the same story with many 'heritage' brands on this side of the pond too. Excellent article! back in the old days was the original outdoor sporting goods store that the likes of JF Kennedy, Hemingway and Pres. Hoover used to grace. That was Abercrombie and Fitch in N.Y City.Talk about going yuppie. My first gun that was given to me by my dad was purchased there and I still have it. That was back around '69 and what a beauty. S/S 410 Dbl. triggers, auto eject,English grip and made in Belgium. I used to love LL Bean and have watched them slowly move away from outdoor hunting pursuits, very sad. ll bean only accounts for 2 percent of their business, it doesn't surprise me that people have had bad experience. Upper managment haver also said that if the hunting and fishing component dissapeard they would be ok with that. Excellent post.! I love everything at Cabela's Outlet Stores it is a fun place to walk around..! !